Quite possibly our youngest (and cutest) volunteer, hard at work sorting parts with her Daddy and OCBC board member, John Verdi. 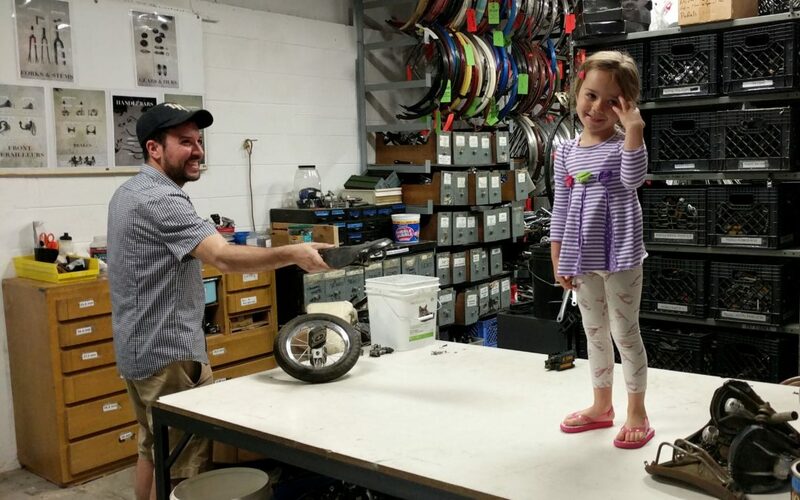 Maya and her father also learned about making your own balance bike, and now she can’t wait to learn how to balance her bike. If you or your child needs help learning, come to the OCBC and we’ll lend you a helmet, (if you don’t bring one) a balance bike, and show you how to get started. We offer this service for free (but donations are appreciated), because it’s part of our mission to “help people use bicycles.” If you are interested in making your own balance bike, we can help you with that too, and we have a wide variety of kids bikes to choose from, usually under $30.